The Financial Page--Eliminate financial stress. Although this page was primarily designed as a free resource for those with financial problems and financial stress, it also contains many articles which will be of great benefit to investors, business owners and even to those who are doing well financially. There's pretty much something for everyone. Note: The information given on this site is accurate and correct to the best of my knowledge. Please know that all of the thoughts, information, suggestions and techniques given on this site are nothing more than the author's opinion on the matter being addressed. Do further research before making any decisions. If you need counseling on matters not related to finances (such as relationships, emotions, personal crisis, marriage, family, etc.) please call 1-800-NEW-LIFE. Would you like to be wealthy or at least out of debt, but instead you are financially stressed? Do you spend too much time worrying about money and how to pay the bills? Do you run out of money each month before you run out of bills? Do you find yourself getting into frequent arguments over money? Do you feel overwhelmed by debt? Are you worried about your financial future? Are you concerned about retirement? Do you wish you could get rid of debt? Do you wish you knew how to become wealthy? If you suddenly, unexpectedly found yourself owing $1,000 for say a car repair, home repair, doctor bill, hospital emergency room bill, whatever it may be; how would you pay it? Be honest. Where would you get the $1,000 to pay the bill? The answer most people come up with involves some sort of loan from friends, family, home equity, cash advance, etc. The most common answer, which is also a loan, is credit card. The correct answer would be to take the money out of your savings account and pay the bill. Did you say you would just take the money out of savings and pay the bill? No? Then you failed the first test. If your income were completely cut off tomorrow, how long could you maintain your present standard of living without borrowing any money; in other words, how long before something had to go unpaid. How long before you couldn't pay your rent/mortgage, electric bill, car payment, grocery bill, etc.? The average family in the Unites States today could go anywhere from three days to one month. The correct answer would be three to six months. Do you have enough cash on-hand and in savings to go three to six months if your income were to suddenly stop? No? Then you failed the second test. If you failed either or both of these tests, you are in financial danger. You are one financial emergency away from disaster. You also, unfortunately, are completely normal! At present time, 70% of Americans are living paycheck-to-paycheck. This simply means that by the time your next paycheck arrives, all of the money from your previous paycheck is already gone...there is nothing at all left over after payments and expenses. And believe it or not, it doesn't matter how much income a person has: 70% of people making $40,000 per year are living paycheck-to-paycheck and 70% of people making $100,000 per year are also living paycheck-to-paycheck. The level of income doesn't matter. If you are living paycheck-to-paycheck, you are normal, and you are living on the edge of financial disaster. The next, relatively large, unexpected bill that comes along will put you deeper into debt and cause all kinds of stress in your life. That's how 70% of Americans are living. The trick is to figure out how to not be one of those 70% of Americans living paycheck-to-paycheck. You need to learn how to not be financially normal. You don't have to live paycheck-to-paycheck. You don't have to be so deeply in debt that you can hardly breathe. You can build up a savings account for emergencies. You can have a little extra money to spend on fun. You can invest for your future. You can have the money you need to do many of the things you want to do in your life. You can become wealthy! Do you have to buy some book or seminar to help you do this? Nope. You can do it all on your own without sending a dime to me. Here on Eclecticsite.com's Financial Page, I will show you how. I will teach you what you need to know to be better off than 70% of Americans. What would it be like to have no payments? How would it feel to have money left over every paycheck? How would it feel to be building up huge amounts of money for retirement? Try this: mentally add up what you spend on debt payments each month. Include such things as your mortgage payment, car payments, student loan payments, credit card payments, etc. Do you have a figure in your mind? Okay, now imagine what it would be like if that amount of money were yours to do with as you pleased every month! It's possible. Thousands of people have done it. I've done it. I'll show you how. And best of all, it's free--you don't have to pay me a thing. Ready? Then read the financial articles you'll find here on the Financial Page. If you haven't read it yet, start with the first numbered article The Secret to Becoming Wealthy. If you would like to find out what God has to say about your money, then please check out my favorite financial Bible verses. If you know of other people who could benefit from the financial advice offered here, please be sure to tell them about Eclecticsite.com's Financial Page. Let's help as many people as we can. If you like what you find here, PLEASE put a link to The Financial Page on your website or blog. Want to reduce financial stress, eliminate debt and get ahead financially? Get started by reading these numbered articles in order. What you need to know to eliminate financial stress and eventually become wealthy. Why you need a budget, and how to create one. Why you need savings and how much you need. The wonderful feeling of being debt free, and how to get there. A quick checklist of what you need to do and in what order. Additional Articles Dealing With A Variety Of Financial Topics. These additional articles are in no particular order. What's on my mind regarding finances. Looking for a quick, easy solution to debt problems? How to know if you are you headed for a financial disaster. From whom to take your advice, and from whom not to. Before you listen to anyone's advice about money, read this! How To Choose Someone To Help You. How to choose the right financial planner, adviser or counselor. How to get ready to meet with a financial counselor. What Can You Really Afford? How much house and how much car can you really afford? When Is It Time To Buy A House? How to know if you're ready to buy a house. Getting ready to buy a house? Then read this. Should You Pay Cash for a House? Is it smarter to pay cash, or to mortgage? New, used, buy, lease? Here are the answers. Will a consolidation loan help you deal with debt? Does having an education really matter that much? How To Be Successful In Any Job. Whether you're flipping burgers or running a company, this is good advice. Do You Have a Big But? A big but always gets in your way! Is It All Right To Have Nice Things? or Why I Have An Expensive Briefcase. Why Is It So Wrong To Use Credit Cards? Why credit cards are bad. A few ideas of how to bring in extra money. A story with a message. How to do it, and how NOT to do it. Don't even think about investing in real estate before reading this. What it is, how to do it, and how it helps you financially. A Christian perspective on handling money God's way. Please read this if you have been helped by this website. Toys-R-Us gift cards...Don't Do It! A story and a warning. If you buy lottery tickets, you better read this. Is it all right to get a little help from time to time? Should I Cosign...Are You Kidding? Is a friend, family member or co-worker asking you to cosign? Do You Think Like a Wealthy Person? How the wealthy think differently than most of us. Here's how to calculate whether or not you are wealthy. Should You Rely On Credit Cards For Emergencies? Is it all right to have a credit card just in case? These are the things that keep you from reaching your goals. What to do with a teen who does not want to go to college. The best ways to pay for a college education. What if you invested your debt payments? You know that smoking damages your health, but what affect does it really have on your finances? Common stupid advice I've actually heard people give. What Kinds Of Insurance You Do And Don't Need. What kinds of insurance to buy and how much you need. Don't Buy Just Because It's A Good Deal. A good deal doesn't mean its a good idea. If you are starting, or thinking of starting, your own business, PLEASE read this! If you have or want your own business, here's how to help it succeed. Would you buy a light bulb that lasts 100 years? Here's how marshmallows can predict your financial future. Honest talk, from one man to another, about what makes a real man. How to invest, how not to invest, and what to invest in. How to get started investing in the stock market when you don't have any money to invest. 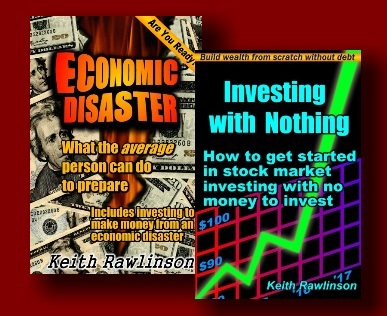 Current eBooks by Keith Rawlinson. Who I am and why I think it's all right for me to be giving you financial advice. A journal of my finance-related thoughts and opinions on current events and conditions. Financial statistics and tidbits I've learned over the years. Six major consumer credit laws dealing with debt collection, credit reporting, borrowing, etc. Ancient wisdom about handling your money. A collection of real gems of wisdom. You can just about live by these! Sample letters for dealing with debt collectors and credit card companies. These are a couple of little finance-related utilities I wrote for my own use. I wrote them in Visual Basic.Net. I offer absolutely no guarantees as to their functionality, usefulness, or support. But, I do use these myself and have never had any serious problems. When it comes to Visual Basic.Net, I am just a beginner who taught himself how to program in Visual Basic.Net and am not a software engineer in any way; so, the programs may not be as refined as they could be and I am sure there are bugs here and there. If you do find any bugs, let me know and I'll try to fix them. These programs will only run on computers that can run the .Net framework (most newer computers can). You can always just try it and see. The worst that has ever happened is that they just won't run. If your computer does not have the .Net framework and you know what you're doing, you can always try installing it yourself with dot net fix. These programs are being made available for personal, private use only and may not be bundled, sold or altered in any way. 1. Right-click on the link for the program you want and select "Save Target", "Saved Linked Content", etc. 2. Where it says "Save in," select Desktop. 3. Click the "Save" button and wait for the file to be downloaded to your desktop. 4. Find the program on your desktop and double-click it to run the program. This is a handy little utility that allows you to quickly do simple loan calculations. You fill in the information you know, and it will calculate the one you leave blank. It not only calculates your payment, but can also figure out amount borrowed, interest rate or time to repay. This is the utility I use most often. It allows you to figure out how much your investments will grow over time. You enter a starting value, monthly contribution, interest rate, and time, then calculate how much money you'll have in the future. Here is a pretty good collection about frauds and preventing ID theft. I am NOT recommending ANYTHING this website might be selling, I am only recommending the free information. The Crash Course is a fantastic, free, educational tool to understanding the economy and learning about the world's financial future. Are we headed for collapse? IRS (Internal Revenue Service) Tax forms. Zenni Optical is a great, online source for eyeglasses for a fraction of what they would normally cost. Put yourself on the National Do Not Call Registry to significantly reduce the number of telemarketing calls you receive. To do the same for junk mail, call toll free 1-888-5-OPTOUT. Free online currency exchange rate calculator. Credit.com allows you to enter totally anonymous, general, financial information and receive a free, estimated credit score instantly. A collection of a variety of free, very useful finance-related calculators from Crown.org. Are you entitled to receive money from unclaimed funds you may not even know about? Use missingmoney.com to find out for free. Use the Credit Union National Association credit union locater to find a credit union near you. Use the Salary.com Salary Wizard to get an idea of the average pay for your job title. Better Business Bureau for doing a background check on a large number of businesses, including online businesses. Charity Navigator.org is an online resource allowing you to check up on the legitimacy and efficiency of various charities before you donate. Clark Howard's credit freeze guide gives instructions for doing a credit freeze to prevent identity theft. Please put a link to The Financial Page on your website or blog. Let's help as many people as we can.